From the Home menu, click "Monthly Deals"
The “monthly deals” section allows to view and update the inventory for each month. You can view availability and rates across all rooms for an individual month. 2.The rooms are displayed down the side. 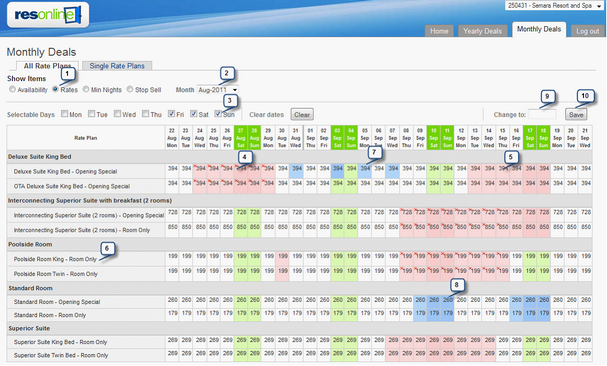 3.Dates highlighted in pink have no availability allocated to them. 4.To update the availability, first select the days of the week you wish to change. 1.To change the rates, click on the “Rates” radio button. You will now see a grid that shows each room type and the associated rate plans with the actual rate for each day of the month. 3.Some days are pink with a red cross in them, these dates have a stop sell applied to them. 4.Other dates are highlighted in pink only. These dates have zero availability. 5.Now select each day of the week you wish to change. 7.Or click on the rate plan name to highlight the whole month. 8.You can also select multiple dates by clicking on the first date and then holding the left mouse button down and dragging until the last date. 11.Updating minimum nights and stop sells is done in much the same way.